Forget ice cream – Almost as fun to make as they are to eat, these healthy taco pizza cones are the ultimate guilt-free snack! Taco pizza cones have quickly become my favorite way to satisfy pizza cravings – let’s face it, we all have those moments – without feeling guilty. As much as I love pizza, sometimes one is just too much for me and leaves me full for 2 days. 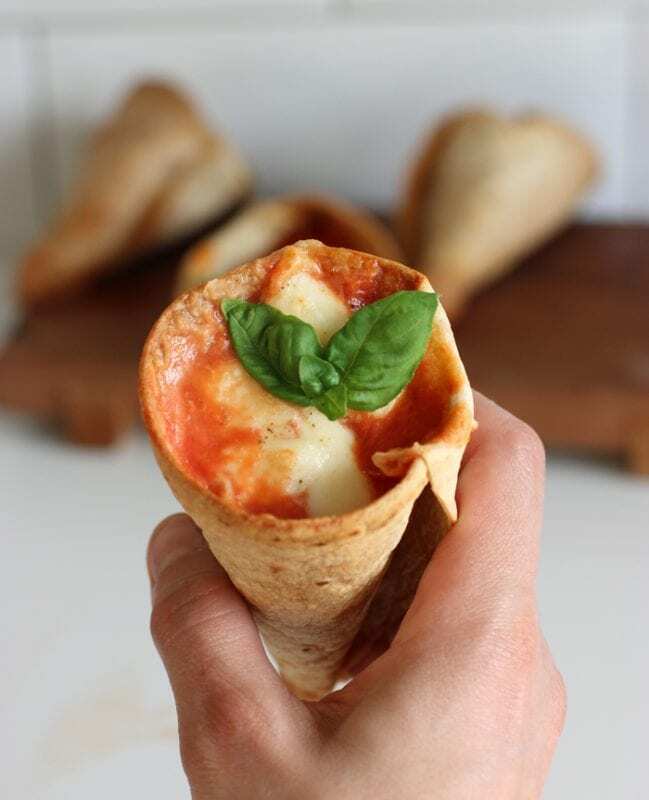 These healthy cones are perfect to get all the pizza flavours in a couple of bites, and make some room for something else, like an energy-packed salad or a light summery dessert. You only need 3 basic ingredients: your favorite tortillas as a base, a fresh easy marinara sauce and organic mozzarella for your filling. If you have time, it’s always better to make your own tortillas. 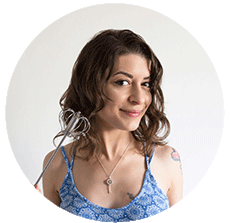 For a last-minute fix, you’ll be just fine with an organic store-bought alternative. I had 8″ white flour tortillas at hand, if you’re using a larger-sized version cut it into 4 wedges rather than using half tortilla. They come together in 30 minutes only, even less if you make the cones the ahead ( just make sure you store in an airtight container). 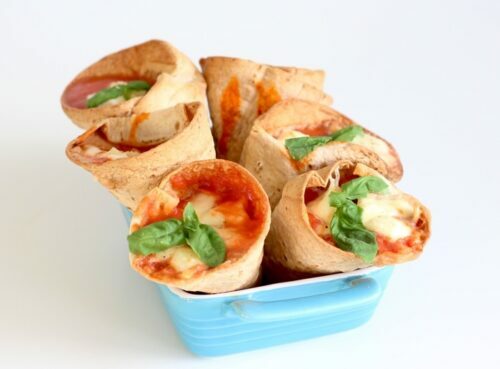 Low in fats and calories, bursting with true Italian flavors, these tasty 2-bite-sized pizza cones make a showstopper appetizer for summer parties as well as all-year-around happy hour snack. How To Make a Taco Cone? 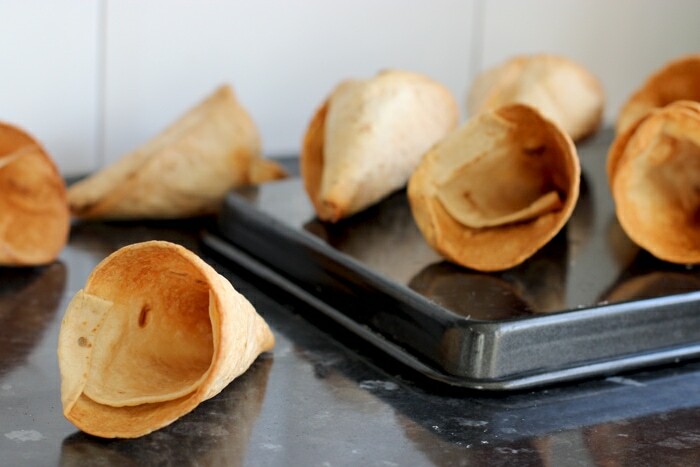 Making taco cones is simple and fun as it looks. I did had to figure out the best way to fold the tortilla first, so I struggled a bit at the beginning, but I’m quite pleased with the result. 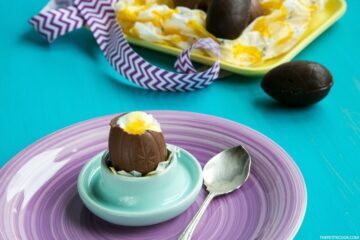 They’re quick to make, hold their shape amazingly well and are super easy to devour. Sounds a good deal! I’ve rolled half tortilla in the shape of a cone and folded the excess on the inside, then pressed it really well to create a nice bond. I’ve also pierced the ends with a toothpick, and I felt this really helped to hold the cone together. 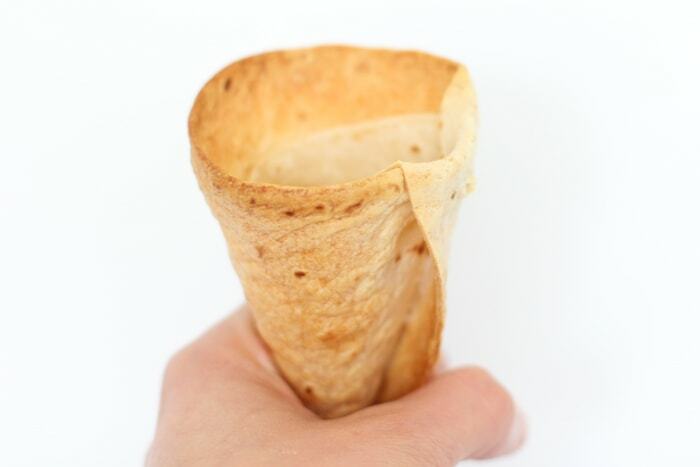 Remove the toothpicks after the cones are baked, they will easily come off, leaving you a perfectly shaped cone. Once they’re ready to be baked, place the cones upright in a muffin tin or baking cup. They sit perfectly in a 12 mini muffin tin, but a larger tin will work just fine. You can also opt for one of these handy cupcake baking racks and serve them straight from there. Brush them with a little olive oil, and bake for 15 minutes or until lightly browned. Let cool a little before filling them up with a simple 3-ingredient marinara sauce. 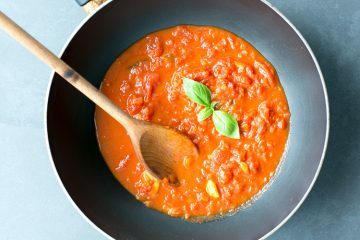 This healthy and light marinara sauce is one of my favorite summer flavors. It’s 4 ingredients only, absolutely easy and takes just seconds to make. Start with high-quality tinned tomatoes, I usually go for the San Marzano variety, which are available at any WholeFoods store. Here’s a great guide on where to find them in UK, but some brands are available for US and the rest of the world too. You can also go for cherry tomatoes, or regular plum tomatoes, just make sure they’re organic and from a brand you trust. Mix the tomato flesh with freshly dried oregano, a glug of Italian fruity extra virgin olive oil, sea salt and freshly cracked black pepper. I throw everything in my Vitamix and pulse until all ingredients are combined. If you like garlic and have no plans on kissing someone, add in a chopped clove too. You can choose to keep a chunky texture or mix a little longer for a smoother version. Add some fresh basil leaves and your marinara sauce is all ready! The last step is filling your taco cones with the marinara sauce. 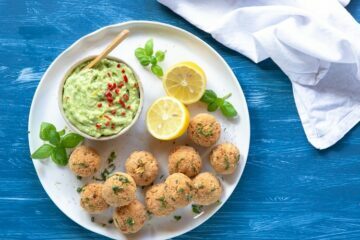 Throw deliberately in some mozzarella cubes and bake for a further 2-3 mins, until the cheese is melted and the cones are golden brown. Decorate with fresh basil leaves and serve your tortilla cones immediately, while they’re nice and piping hot, just the way you would have pizza. 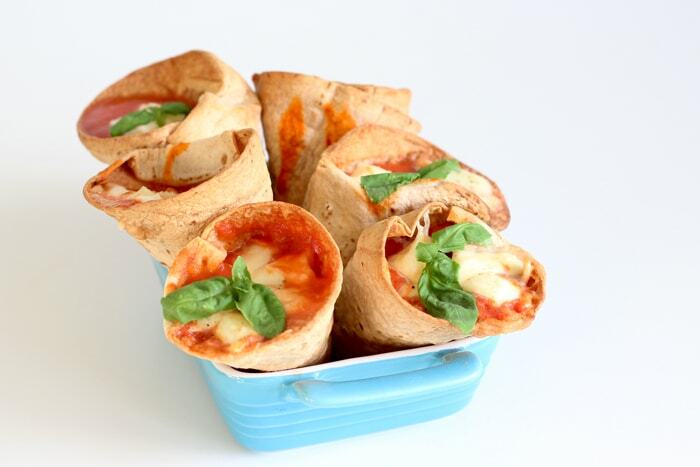 Before I forget, these healthy pizza cones are totally vegetarian, so they make a perfect snack for tomorrow’s meatless monday! If you’re looking for more delicious ideas, check out more meatless monday recipes. Pre-heat the oven to 180C/375F. Cut tortillas in half. 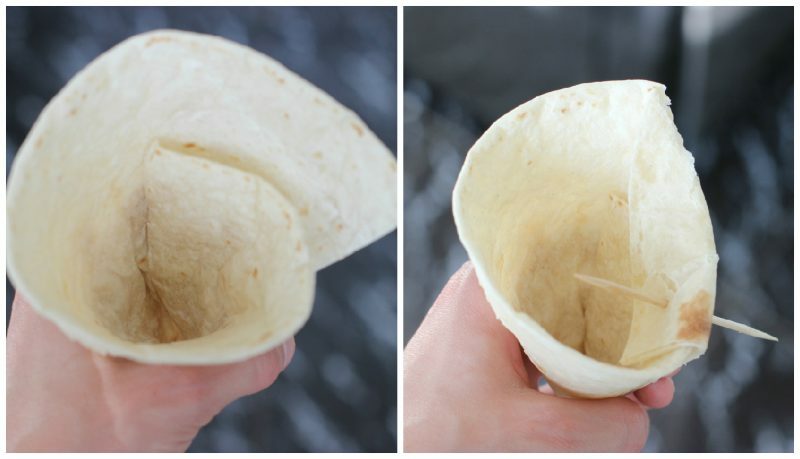 For each cone use half tortilla. Roll the two cut edges around each other, creating a cone.Fold the excess on the inside and press to bond together. Pierce the edges with a toothpick to firmly hold the cone together while baking, Brush very lightly with olive oil on the outside of each tortilla cones. 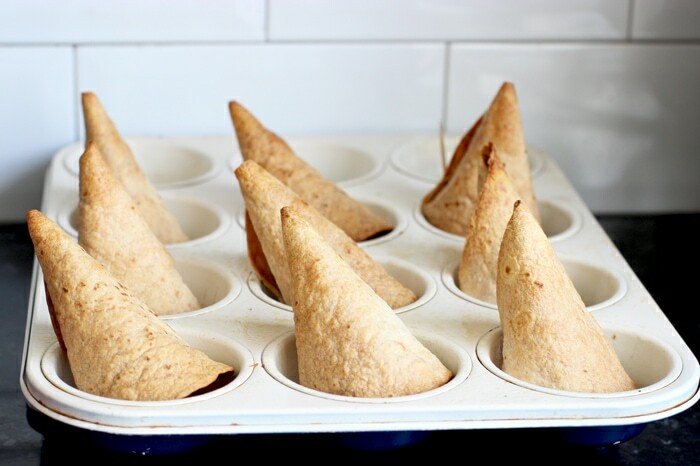 Place the cones upright in a muffin tin or baking cup. Bake for 15 minutes or until lightly browned. Let cool a little. 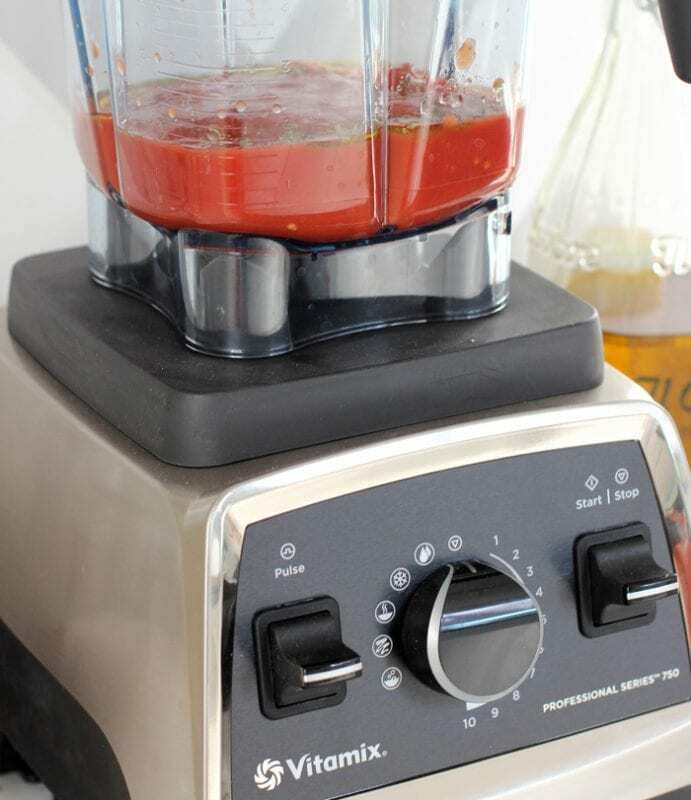 For the marinara sauce: Drain the tomatoes and remove juice and seeds inside. Transfer into a blender (I use a Vitamix), add olive oil, oregano, salt and pepper. Blend until just combined to keep a chunky texture. 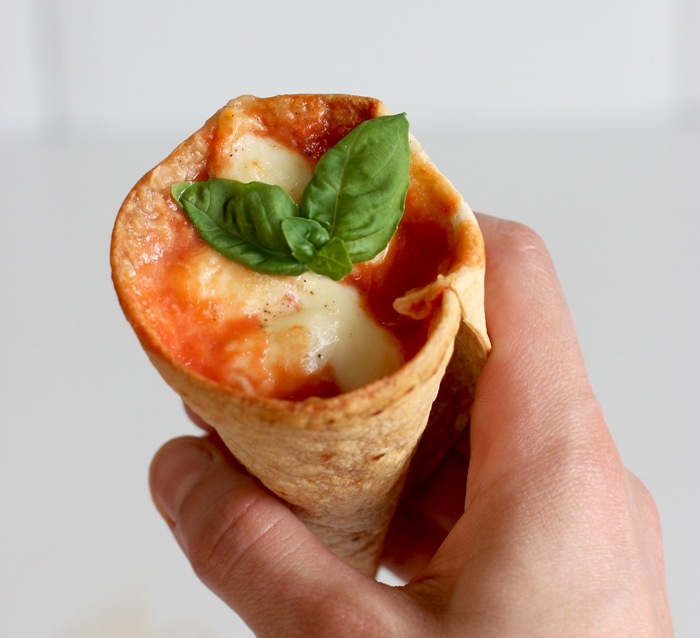 Fill the cones with marinara sauce and mozzarella cubes. Place your filled pizza cones in an oven-safe mug, glassware, or a specialized rack that can hold them upright, and bake for an extra 2-3 minutes on 200C/400F, or until the cheese is melted and cones are golden brown. Take out from the oven and serve immediately while they're nice and hot. Makes 6 mini taco pizza cones. You can prepare the cones ahead, and store in an airtight container until ready to use.